A little bit of Mahler is always good for you every now and then. The fiery Gustavo Dudamel conducts Mahler'sSymphony of a Thousand at the Salzburg Festival. The Simón Bolívar Symphony Orchestra of Venezuela (formerly known as the Simón Bolívar Youth Orchestra of Venezuela) is the orchestra of the music education program El Sistema, founded in 1975 by economist and musician José Antonio Abreu. The most illustrious representative of this program is certainly the superstar conductor Gustavo Dudamel himself, now at the head of both the Los Angeles Philharmonic and the Simón Bolívar Symphony Orchestra. This concert opens the El Sistema residency in Salzburg. This performance also inaugurates the Mahler cycle of this 2013 edition of the Salzburg Festival. And the orchestra chose one of the composer's most impressive works, the Eighth Symphony, also calledSymphony of a Thousand because of the huge amount of musicians needed to perform it. The two hundred young musicians of the El Sistema orchestra join forces with the Simón Bolívar National Youth Choir of Venezuela, the Wiener Singverein, the Salzburger Festspiele und Theater Kinderchor, the singers of the Superar project, eight internationally reknowned soloists (Emily Magee, Juliane Banse, Anna Prohaska, Yvonne Naef, Birgit Remmert, Klaus Florian Vogt, Detlef Roth and Robert Holl) and the organist Pablo Castellanos. 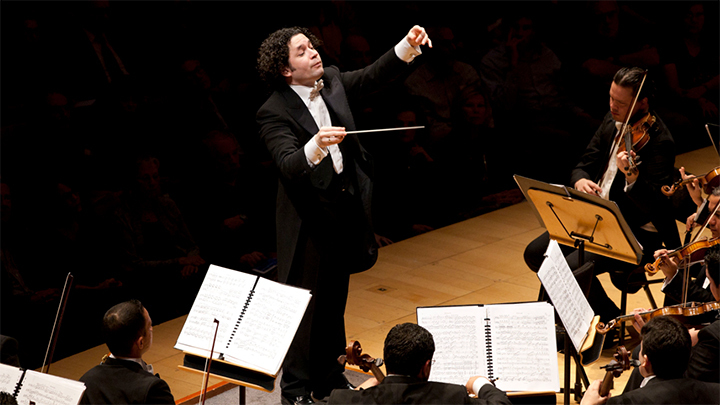 For six months of the year, the orchestra works with its Music Director Gustavo Dudamel, with whom it also made its Salzburg Festival debut in 2008. In 2011 the Simón Bolívar Symphony Orchestra whetted the Salzburg audience’s appetite for more with its rousing performance of Mahler’s Symphony No. 2. Dudamel: Mahler, Symphony No. 8 "Of A Thousand" on medici.tv.